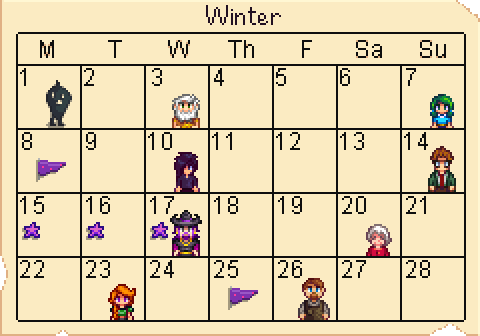 Winter is the fourth season in Stardew Valley. It's followed by Spring and preceded by Fall. Winter is one of the most difficult seasons, because all the grass and weeds on the farm die out. This makes fiber and hay more difficult to obtain (fiber can still be found in The Mines, but hay must be purchased from Marnie's Ranch). However, some of the most valuable items in the game appear only in Winter. There are no plantable crops in Winter with the exception of Winter Seeds. There are a variety of fish which can only be caught during specific seasons. Listed below are all fish catchable during Winter. Fish that can be caught during all seasons are not listed. Note: Any Fish can be used for recipes with the tag "any fish" (i.e., Sashimi, Maki Roll, Quality Fertilizer). This page was last modified on 4 November 2018, at 15:34.